An Email Security Risk Assessment conducted this year by Mimecast re-examined more than 40 million emails that had been OK’d by various security solutions, including Office 365. Of those, more than 19,000 were found to be “dangerous file types,” infected with malicious malware attachments or cleverly disguised impersonation attacks. 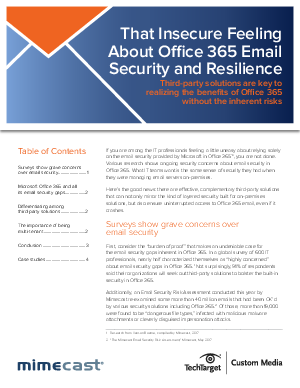 This expert white paper explores how you can close Office 365 email security gaps. Learn considerations for evaluating security services that can bolster your email security.